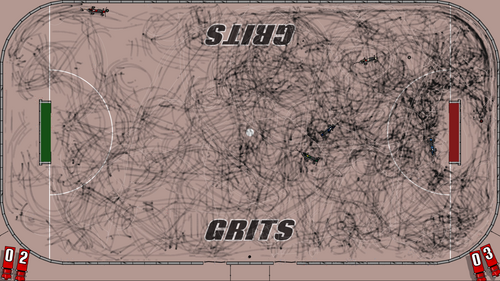 GRITS Hockey is starting to take shape but still has a long ways to go before it's fun for most players. Seen here is a test with 5 players from last Tuesday. The biggest missing feature right now is drifting car setup (or some other more fun physics setup with the car). But, actually, what is likely most required to make this minigame fun for most people is testing with various "hockey stick" attachments. Currently, what is in use here is a rear stick for use with hand-brake spins, and a front blade. Those help (much to the dismay of the ideal in my imagination which hoped for no attachments) but what would probably help more are attachments that give the players some minimal capture control of the ball/puck/loose wheel.